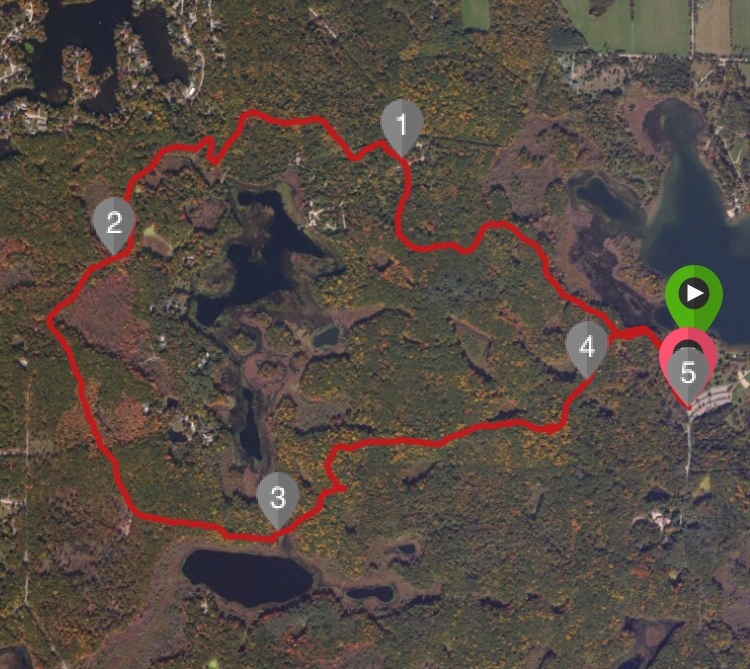 Runs for Cookies: First trail run! Ever since my younger brother, Nathan, started training for his ultramarathon over a year ago, he's been trying to talk me into giving trail running a try. It wasn't that I was against trail running (I've always thought it would be fun to try), but we just don't have any trails around here. 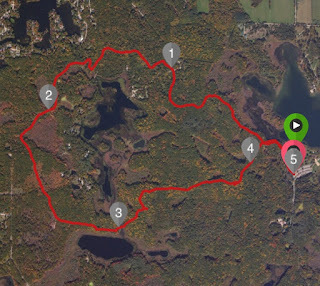 Nathan would drive all the way up to Pinckney to run the trails, but I just couldn't imagine driving 75 minutes each way for a run. I always told Nathan, "Some day, I'll go with you" but that day never came... until yesterday. I finally made plans to go run the trails in Pinckney. Nathan and Kendall both happened to be off work yesterday, so we made plans to go up there while my kids were in school. It was kind of interesting while I was getting ready to leave--I had no idea how to dress for trail running. I ended up just dressing the same as I would for road running--running tights and a tank (I brought a jacket, too, but ended up leaving it in the car). I told Nathan I didn't want to do more than six miles, so I didn't need to bring water or fuel or anything. I drove over to Nathan's house, so that I could bring Joey to play with their dogs while we were gone, and then Nathan drove to Pinckney. After we parked, we checked out a map of the trails to figure out what we wanted to do. The trail was kind of narrow in a lot of spots, so we ran single file, with Kendall in the lead so she could set the pace. Almost as soon as we started running, the first thing I noticed was that it's nearly impossible to run with a heel strike while running on dirt and with lots of hills. Heel striking has a reputation for causing injuries, so I think trail running would be great for someone who is trying to adopt a mid- or forefoot strike. Also, running on the dirt was actually really comfortable. My eyes were glued to the ground at first, because I didn't want to trip over tree roots or rocks, but once I got used to it, I loved the feeling of running on dirt. Kendall was getting over a cold, so we took it nice and easy--but that's the best part about trail running! Pace doesn't matter. Once I was able to stop focusing on the ground, I was able to look around and see how pretty it was! It was a gorgeous day for a run, and we had some really nice views. As we were running, I was wishing that this place wasn't so far away! But I'm glad I finally decided to go give it a try, because it would totally be worth the drive for a long run once in a while. When we got back to the start of the loop, my Garmin showed we'd only run 4.5 miles, and not 5.1--but either way, it was so fun! 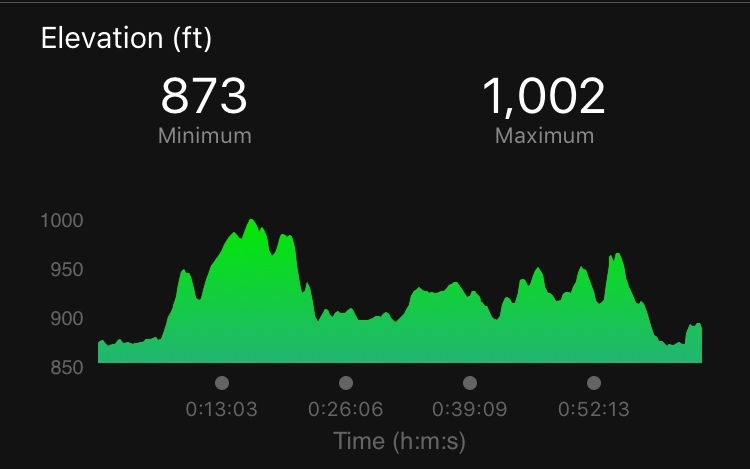 Nathan told me that when he started trail running, he got a lot faster in his normal road running pace without even trying (likely due to the hills). I've never enjoyed hills on a road, but running hills on the trail was actually a really fun challenge. They weren't ridiculously hard, but considering I don't have any hills around my house, they were significant enough for me. When I told Nathan how much I enjoyed the trail, he said, "So, you're ready to train for an ultra?" Hahaha, NO. There will be no ultras in my future, but I definitely want to make it a point to do some long runs on the trails. The day went by so fast, though--I left home at 9:30 to meet at Nathan's at 10:00. By the time we drove up there, did our run, drove back to Nathan's, and I drove home, it was time for Noah to get home from school! The run was super fun, though, and I'm glad I finally gave it a try. 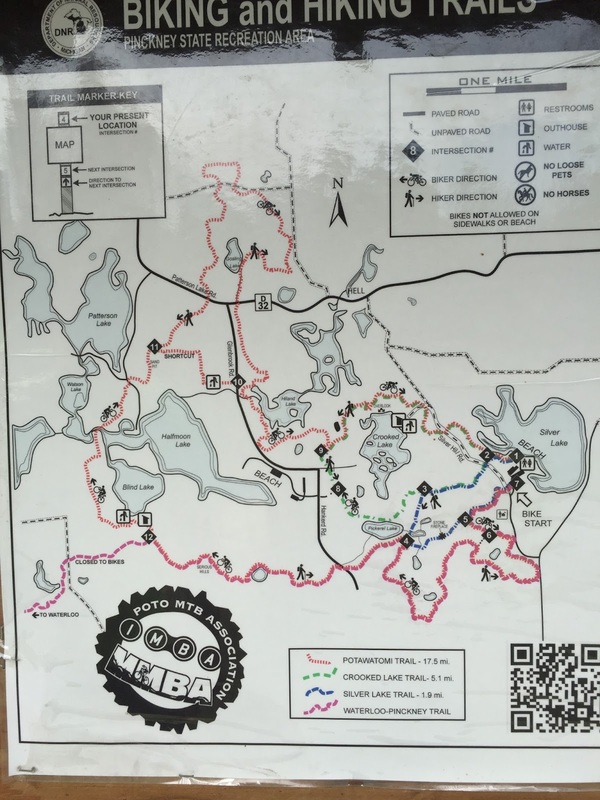 We have an awesome trail system where we love and I've only tried running in them once. I like my flat surfaces! But you've given me the push I need to try it again! I haven't tried trail running yet but there are a TON of trails around where I live. I've walked them a ton but I'm a little too chicken to try running them. Maybe I'll work up the courage sometime. 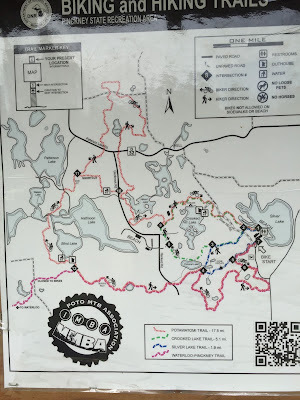 If you're ever in Wisconsin, the Kettle Moraine trails are awesome! I went to school in Ann Arbor and would run through the arboretum on the trails often. It was a great place to run! Made the time go a lot quicker than on the road or treadmill. I'm lucky to live in NZ where trails tend to be nearby no matter where you live. There's one literally down the road from my place which I live running, and a few within 30 minutes of driving. I enjoy being on a trail so much more than around roads, however it's hard to find flat ones so the hills can be a bit of a challenge! Have you ever looked into Oak Openings down here in Toledo? I am just getting familiar with it thanks to a couple friends. I normally stay on paved paths, but the friends are more into trails. Last weekend I joined them for a walk on one of the trails. It was really nice. There were small hills but probably not like what Pinckney has. An idea for you. Might be a little closer than Pinckney? It's a super cool park.